RELAX and ENJOY our custom decorated sports themed 2 BR/2 Bath Loft unit. Located in the AAA 4 diamond rated OSTHOFF RESORT. Conde Naste #1 Resort in the Midwest. Travel & Leisure top 15 Lake Resorts in US. Spa, beaches, pools are exceptional. The 3rd floor location ensures quiet relaxation. Large master BR/Bath with jacuzzi tub is upstairs for extra privacy. Unit is located in main building close to dining/bar, spa, pools, laundry facilities and workout center. Historic Elkhart Lake is over 100' deep ensuring exceptionally clean water for swimming, boating, fishing, and water sports. Road America racing is a couple miles away. Quit Qui Oc Golf Club is within walking distance and the Whistling Straits/Blackwolf Run courses are close by. Local dining/bars are superb and all within easy walking distance. On site activities include a full service spa, full workout facilities , cooking school, dining options, water sport equipment rental, bikes, beach and pier , 2 outdoor pools, indoor pool, hot tubs, and sauna. Come this year and make it an annual event. WE DO REQUIRE A SIGNED CONTRACT, REFUNDABLE SECURITY DEPOSIT AND 2 WEEK ADVANCE RESERVATION. Hi. I'm Dave Schmitz and I grew up in Kiel WI (6 miles from Elkhart Lake).My wife (Helen Himes) and I like the area so much we live at Osthoff Greens. Quit Qui Oc golf course (down the street)was my 'home course' for high school golf. I graduated from the Air Force Academy in 1975, flew fighters in the Air Force for 14 years and flew for Delta (Northwest) from 1989 to 2015. You'll quickly realize I was NOT the decorating expert as Helen masterminded and executed that plan. Helen grew up in Arizona (our winter home location) and Southern California and graduated from Long Beach State. She is a recently retired Civil Engineer and the CEO of HH Engineering Ltd in Detroit. 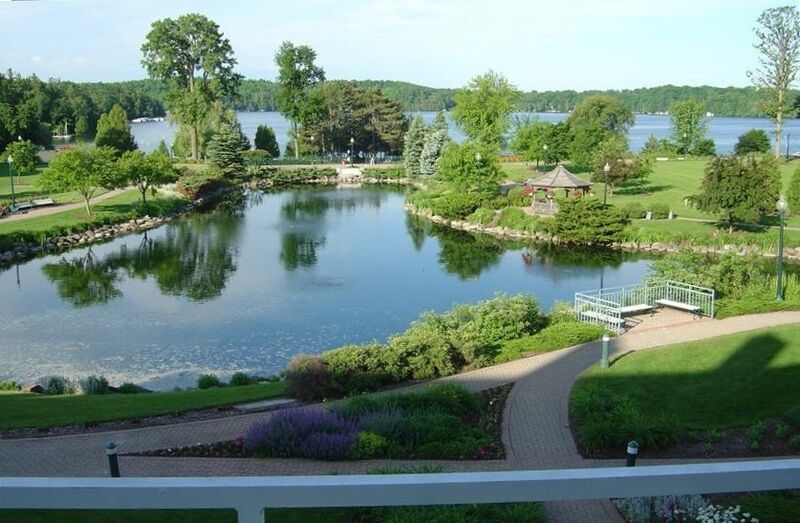 We both love the Elkhart Lake area and just retired there. The people, attitudes, food, and beer are fantastic- we love it. We were one of the original purchasers in the Osthoff development. Our custom decor and upgrades don't fit the standardized Osthoff rental plan -- hence the VRBO approach. Unparalleled amenities. Unspoiled lake and watersports. Fantastic food, bars, and golf all within walking distance. Road America up the road. Great staff and locals. In main building near all amenities. The decor is NOT child proofed and therefore children over 6 are welcomed. Lovely, cozy, well-appointed vacation accommodations. Every detail was accounted for in this 2-bedroom loft unit at the Osthoff Resort. The decor was sports-themed. All of the furnishings and kitchen needs were supplied. View was nice. Care was given by the owners to make my getaway abode a perfect place to luxuriate in the snowy month of January. Loved the spa. We recently chose this condo for a weekend getaway. There were only two of us, but it could have comfortably accommodated four. The kitchen had all the appliances needed, beds were comfortable, and the condo is situated close to the center of the resort. The resort itself has a nice little beach, beautiful grounds and two very good restaurants. There is also a very nice bar/lounge area with a large balcony overlooking the lake. Osthoff is definitely the place to stay if you are visiting the Elkhart Lake area. well maintained condo...nicely decorated in a sports theme. Osthoff is a first class facility, with many amenities and top notch, friendly staff. It's also close to nice restaurants and attractions, although you can't go wrong with the Osthoff restaurants. Stayed for a week. Great property and unit. Nice decorating. Will stay in this unit again. Both the resort and the condo are well deserving of the 4 star rating! The beach is beautiful - fine sand, clear water. Everyone at the resort was very friendly and helpful and again, that is also true of the owners of this unit. The condo is decorative very nicely, quiet location in main building, and very comfortable living space. We highly recommend it and look forward to our visit again hopefully next year too! NO PETS NO SMOKING 4 Guests MAX Signed contract required- will be provided by owner after booking. Two weeks advance reservations are required. Rates subject to change without notice.